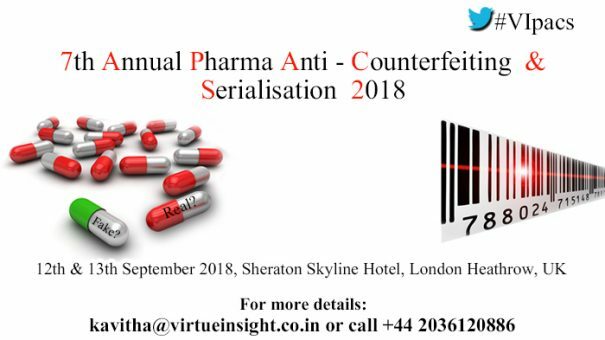 7th Annual Pharma Anti-Counterfeiting & Serialisation 2018 overviews and integrates the business and technical problems that pharmaceutical companies should be aware of in order to fight the major global problem of counterfeit medicines. The Delegated Act includes several unexpected rules that add complexity to FMD planning and preparation. Many supply chain companies have raised questions related to the impending Delegated Act requirements and we could find answers for all of them at our conference. In addition to discussion of the problems, this conference addresses serialisation, track and trace analytical techniques scientists use to detect counterfeits and identifying solutions to the threat of counterfeit medical products. (FMD) Deadline – February 2019 for serialized authentication of pharma products – Are we ready? Getting ready for DSCSA, EU FMD and other global regulations? Pharmaceutical manufacturers and distributors, Healthcare professionals, Pharmacists, Serialisation, Track and Trace – Solution providers, Brand – protection, enforcement, security, integrity and management companies, Drug regulatory agencies, customs and police, Intergovernmental organizations (IGOs) involved in healthcare and IPR protection, Non-governmental organizations (NGOs) active in healthcare, Patients’ representatives, Healthcare research organizations, Pharmaceutical associations, Anti-counterfeiting organizations, Packaging, labeling and converting companies, Authentication technology suppliers, Anti-counterfeiting service suppliers – IP specialists, investigators, lawyers. Conference Sponsor & Exhibition Stall – Should you wish to Sponsor, or purchase a Exhibiton Stall (Booth) or a paid Speaker Slot, you can simply email your interest and queries.